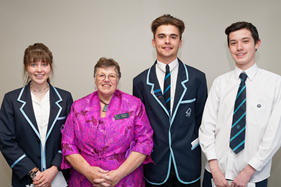 President-elect, Donna Reed, attended the prizegiving at Aotea College on Tuesday 7 November. She was there specifically to present the Plimmerton Rotary Awards for Service Above Self. The Plimmerton Rotary Award for Service Above Self is awarded to a student who has participated in a wide range of co-curricular activities and has fully immersed themselves in the life of the college. The Year 11 Rotary Service Above Self Award was presented to Annie Grenfell. Annie is a member of the Aotea College Kapa Haka group and Stage Challenge 2017. She was a member of this year’s barbershop chorus who came 1st in this year’s national competition, as well as being a member of the quartet `once in a blue moon` and performs in the Jazz band - Coffee at Charlie’s - and the Aotea College Jazz big band. Finally, Annie has led and conducted 60 Aotea College singers in the Wellington Big Sing festival at the Michael Fowler Centre in June this year. The Year 12 Rotary Service Above Self Award was presented to Matthew Groom. Matthew has demonstrated passion and commitment to both the environment and humanitarian issues throughout the year. He began the year as part of the Papa Taiao team, clearing scrub at Hongoeka Marae. He participated in Relay for Life, assisted in the propagation of 100 baby Kowhai trees, and won the Highly Commended award in the under 18 category in the Imagining Decolonised Cities competition. Matthew's biggest project is named 'Stand for Earth', creating a website, together with various social media platforms, to educate others about various environmental and human rights issues and provide links to petitions, charities and products. Matthew has devoted significant time to developing this website, researching various environmental and human rights issues, and making people aware of these issues and providing them with opportunities to help. The Year 13 Rotary Service Above Self Award was presented to Ben Sawrey. Ben has taken on the responsibility to engage with a wide range of extracurricular activities and is always willing to help in the college and wider community. He is an intermediate youth group leader, organising and facilitating meetings every Friday night. He is also a member of the Secondary Students Choir representing New Zealand in Hong Kong and Shanghai. He's an active participant at the Coffee at Charlie’s Aotea Jazz Band, a pivotal member of the Rugby Union 1st XV, Dragon Boating and JNS Barbershop Group, Aotearoar Boy’s barbershop chorus and Aotearoar Nationals. He has also been a leader of Kapa Haka. Ben has already secured NCEA Level Three merit endorsement. Ben was also the recipient of a Porirua Youth Award in August of this year, valued at $1500, in recognition of his outstanding contribution and leadership in the Arts. 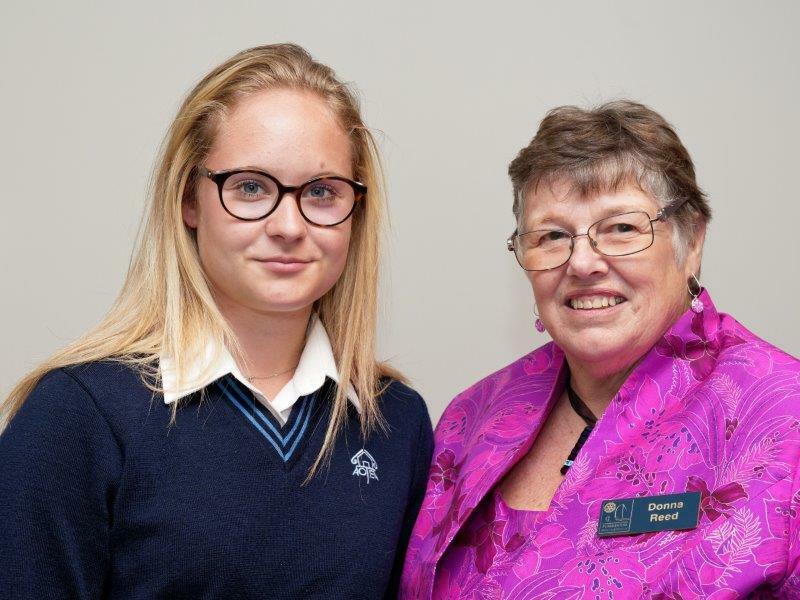 It was particularly delightful for Donna to be at the prizegiving to witness presentations to our own Exchange Student, Amandine Veine when she won three awards - for French, (perhaps unsurprisingly) English and Te Reo. Original generation time 1.2343 seconds. Cache Loaded in: 0.0143 seconds.